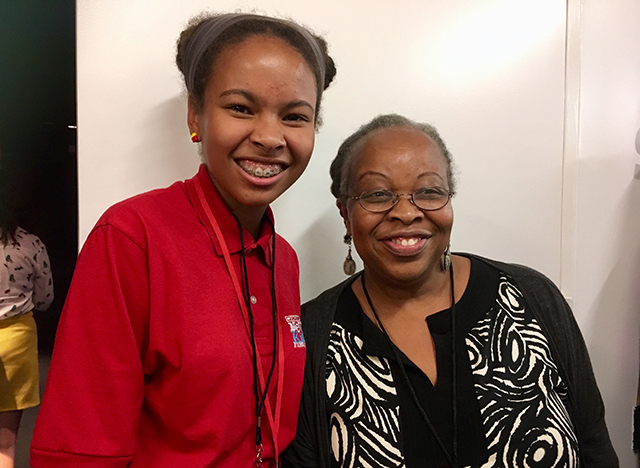 Well-Read Black Girls Come Together | Kid Reporters' Notebook | Scholastic Inc.
Click below to see clips from Adedayo’s interviews with authors at the Well-Read Black Girl Writers’ Conference and Festival. It’s just a beautiful thing to have so many black women together, celebrating the love of the written word,” said Liara Tamani, author of the young adult novel Calling My Name. Tamani was referring to the inaugural Well-Read Black Girl (WRBG) Writers’ Conference and Festival, which was held earlier this year in Brooklyn, New York. Hundreds of writers and artists attended the event at BRIC, a local arts organization. Glory Edim, founder of the WRBG Book Club, funded the festival with a Kickstarter campaign that exceeded its fundraising goal in less than a week. Renée Watson, founder of the I, Too, Arts collective based at poet Langston Hughes's house in Harlem, coordinated the “Dream Keepers” panel for young readers. Middle grade and young adult authors Rita Williams-Garcia (One Crazy Summer), Tracey Baptiste (Rise of The Jumbies), and Nic Stone (Dear Martin) were among those who participated. Several authors said that they were happy to have a place to gather where they could share their love of reading. Adedayo with some of the authors who participated in WRBG. Left to right: Renée Watson, Nic Stone, Liara Tamani, Jacqueline Woodson, Ibi Zoboi, and Vashti Harrison.